As a student, Kay Cosserat (nee Macklam) attended Goldsmiths College London where she achieved a 1st class hons degree and then completed her MA at the Royal College of Art. Upon graduating from the RCA she set up her own business Cosserat Design Partnership in 1974 with her husband Christopher Cosserat whom she had met at the Royal College. Specialising in knitwear and well known for her beautiful colour choices, combinations and use of texture, Kay was quickly noticed for her ability to be creative and commercial. In 1986 this was recognised and she became a Royal Designer for Industry. She was always passionate about education and this lead her to have many, many roles within academic institutions across the country, St Martins school of art, the Royal College and Chelsea college of art to name just a few in London. Kay as I first met her. I met Kay at Chelsea College of Art in 1997 where she became my tutor in the 2nd and 3rd years of my degree. As a tutor, Kay could be fairly terrifying and she certainly let you know if she didn't like something but all this aided in creating a healthy competition amongst her students and a real desire for her approval. Kay's standards were always very high and she had an ability to see a glimmer of something promising in every student's work and draw it out into the most marvellous project. Kay was a much loved tutor. At the end of my course at Chelsea and with a lot of encouragement from Kay, I applied for an MA place at the Royal College of Art. Although I was offered a place, without funds and much forethought about how I was going to finance myself through the 2 year course, I reluctantly had to turn the place down. Kay, always supportive, was quick to offer me a job for a year to raise money for my MA course and give me invaluable experience working within the textiles industry. A year later, with money in my pocket, I applied again to the RCA. I started my MA in 2000. This is where the story starts to sadden..............after returning from a holiday in Vietnam, Kay complained of her back hurting. Further investigation revealed that she had breast cancer. Ever determined, Kay carried on as much as possible and continued to be as supportive as ever to her students and dedicated to her business. 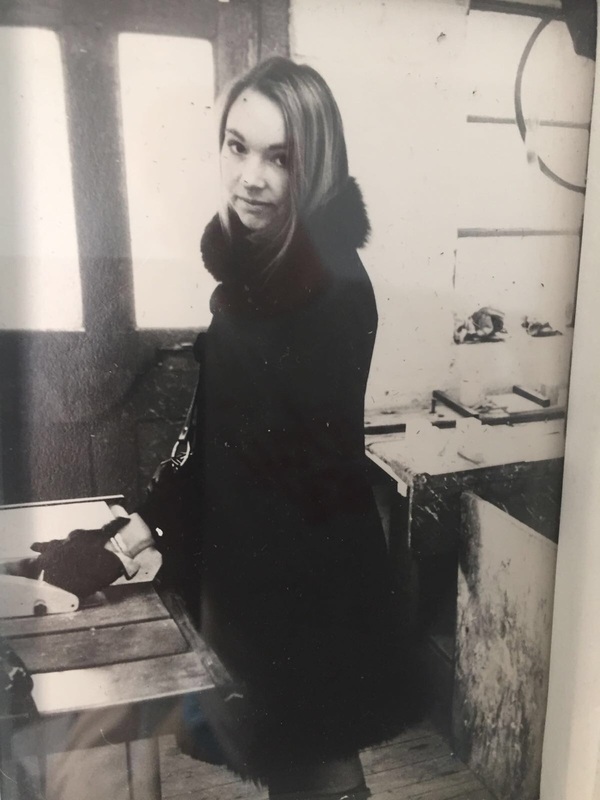 During that year Kay put me forward for the coveted position of design assistant at Orla Kiely, Kay having taught Orla herself. Very sadly I had only been in that post for a week when Kay died in December 2003. A silver lining............before Kay died she set up a trust fund to help knitwear and knitted textile students at the Royal College of Art. There are 5 trustees, of which I am one, and we award an amount to a promising RCA student who would have otherwise found it difficult financially to continue on the course. Every May/June I travel to the Royal College of Art and meet with the other trustees to look at the work of selected candidates and make a final decision about who will be awarded the money. It is always a fantastic day where we meet dedicated, talented students and we reminisce about Kay in all her creative glory. Julia Pines, Matthew Cosserat and Mary Restieaux discussing student's work. This year was no exception, the students work was of a very high standard and they all remained passionate and positive despite hearing their heart-breaking financial stories of hardship. One student had five part time jobs and others admitted to having nearly £45,000 of debt! We saw 14 students in all and the decision of who to award to, was as always, so difficult to make. We awarded 2 scholarships this year, one to Matthew Duffy and the other to Rose Danford-Phillips, both very deserving knitwear candidates who showed us real talent, determination and passion in their work; all qualities Kay possessed. Keep your eyes out for these two names, we joked this year that all the Kay Cosserat Scholarship winners go on to be very successful! Each year, as I walk away from this inspiring day of judging, it always delights me that even in Kay's absence, her dedication to both the textile industry and design education lives on through the students we see.